Enjoy the Music.com has both our Review Magazine and Superior Audio publications now online! Superior Audio includes professional assessment by established British journalist Alvin Gold who offers his insights on the Bowers & Wilkins 800D loudspeaker. Also within Superior Audio is an updated review of Magnepan's celebrated MG 3.6 by Steven R. Rochlin. Our Review Magazine includes reviews of Audio Note's DAC 2.1x Signature, Decorating For Music, and Outlaw Audio's LFM-1 subwoofer. Bill Gaw discusses the Velocitor S and Golden Sound GSIC while Steven Stone continues his nearfield journey with this month's article embracing amplification solutions. While Enjoy the Music.com has just completed our coverage of the Montreal show with well over 100 photos spanning 7 pages, we are preparing for New York's PRIMEDIA (Stereophile) show and also the Munich High End Society event. The New York show begins this Thursday and operates through Sunday. Only a few days later, from May 5th through May 8th, we will feature virtually live coverage of the Munich show! WAVAC Audio Lab's new MD-300Bm single-ended triode monoblock amplifiers have an ultra-wide frequency response from 20Hz to 75kHz with the aid of Tango-based transformers. 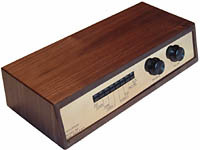 Western Electric WE-300B standard output, WAVAC's patented Inverted Interstage Transformer Coupled (IITC) circuit, no capacitors in signal path, ground lift switch, and 10mm thick top plate are but a few of the features that insure ultra quiet operation. No pricing given at this time. VTL will unveiled their new TL-6.5 Signature Preamplifier ($8,500) that features a high current/low impedance output stage coupled to a vacuum tube gain stage. The power supply stages are fully regulated and shielded. Other high-end features include fully balanced operation, top quality parts, and a simple circuit topology with extremely low negative feedback. Luke Manley, President of VTL, said "While it is always interesting developing cutting edge designs, what is really exciting and rewarding is to see what the technology will yield at lower price points. With a more affordable price tag the TL-6.5 brings the unrivalled sound and unparalleled functionality of its Reference big brother to a wider market. We've taken the proven technology and sound quality of the critically acclaimed world-beating TL-7.5 Reference Preamplifier and scaled it into the single-chassis TL-6.5." Acoustic Solid. distributed within the USA by wHiFi, has announced three new turntables. Precision German engineering combined with various materials are features in their new models Solid Wood ($3,700, seen here), Solid Classic Wood ($1,500), and Solid Transparent ($1,395). Acoustic Solid's Wood features precision engineering and their new bearing, whose sleeve material is used in industrial bearings that handle a staggering 100 tons of pressure. The 50mm platter is solid aluminum plus a felt mat and 6mm acryl layer. MDF base is 60mm and wrapped in cherry veneer. All models include a synchronous motor driven by tight tolerance power supply insures speed stability. The Wood and Solid Transparent include a WBT 250 tonearm while the Solid Classic Wood includes a RB-250. With a 30mm aluminum platter, the Solid Transparent includes an acoustic felt mat and 6mm acrylic layer. Monitor Audio's new Silver RS Series replaces their Silver S with improved drivers and upgraded cabinets. With an appearance similar to the Gold Series, Monitor Audio has added strategically placed cabinet bracing adding rigidity while also choosing to use their accurate C-CAM Drivers (tweeters and woofers) driven by fine-tuned crossover networks fitted within the enclosure. The new Silver RS range consists of the RS 1 bookshelf loudspeaker ($849, not shown), RS 6 ($1499) and the RS 8 floorstanders ($2299). Also within the new RS Series range are home theater products including RS LCR surrounds ($749), RS FX di-/bi-pole ($999), and RS 12 subwoofer ($1299). Accuphon Audio has released their Model 88 Pre-Amplifier and Model 80 Power Amplifier (�1995). After several years of design and development for both units, the Model 88 Pre-Amplifier provides seven line level inputs chosen via illuminated pushbutton. Pre-Outs and Record-Outs are available on balanced XLR and unbalanced RCA/Phono connectors. Of the seven inputs, one is balanced XLR with the remaining via unbalanced RCA/Phono. Electrical power for the unit is via the Model 80 Power Amplifier or external adapter to insure power supply noise does not negatively affect the critical pre-amplification stage. Accuphon Audio's Model 80 Power Amplifier is rated at 25 watts per channel, 2 channels into 6 ohms. Operating in "Class A," the Model 80 Power Amplifier employs MOSFETs in a bridged configuration to provide bridged output. The advantages of this implementation include rejection of the interference. Inputs are balanced XLR for signal while loudspeakers outputs are 4mm banana sockets and four pole Neutrik Speakon socket. A common feature for both units are high quality wood cases in either Maple, Cherry and Walnut, with brass panels front and rear. Internally, both unit's chassis are made from alochrom-plated aluminum and support glass-fibre PCB's with copper screening layer (to aid in rejecting strong interference signals). Accuphon Audio is said to be working on their Model 50 Integrated Amplifier, Model 100 Universal Disc Player, and Model 88 Digital Amplifier. The UK's Creative Archive Licence Group that includes the BBC, Channel 4, British Film Institute (BFI) and Open University (OU) and hoping to allow free access to "give the public access to footage and sound from some of the largest film, television and radio archives in the UK, as well as specially commissioned material" according to the press release. While the Creative Archive Group is hoping other organizations will join, the combined content of the BBC and BFI alone is immense and spans decades. This new initiative will provide Internet users legal access to material completely free of charge. The main rules for using content are that it be used for non-commercial purposes, to share your content freely with others, to provide credit to your content source, to not endorse nor use content for derogatory purposes, and of interesting note is that the Creative Archive content is made available to broadband users within the UK for use [primarily] within the UK. Mark Thompson, Director General of the BBC, said "The Creative Archive Licence provides a unique solution to one of the key challenges of rights in the digital age, allowing us to increase the public value of our archives by giving people the chance to use video and audio material for their own non-commercial purposes. All four partners in the Creative Archive Licence Group feel this is a fantastic opportunity for other broadcasters and rights holders, and we would urge them to join us." Dali is now offering their new Concept range S12 self-powered subwoofer (�550 excluding VAT). To compliment their Concept range, the S12 provides low frequency support via a 12-inch driver featuring a powerful magnet and elongated/vented pole piece. This aids in long excursions to produce prestigious bass while optimizing cooling of the voice coil. Dali has integrated a 160 watt "Class A/B" amplifier with level control and variable crossover frequency adjustment from (50Hz to 170Hz) with absolute phase switch (0-180�). Frequency response is from 29Hz to 170Hz (+/- 3dB) with a maximum SPL output of 110dB. Inputs include mono RCA input (LFE) and stereo RCA low-pass (variable frequency) while the sturdy cabinet is made from 18mm and 28 mm MDF. Weighting 46.7 lbs and measuring 16.1 x 15.0 16.5 inches (HxWxD in inches), the cabinet comes in a metallic-anthracite baffle and cherry or light oak finish. Acoustic Sounds has released two new direct-to-disc vinyl LPs. 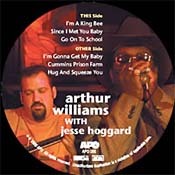 Both the self-titled albums Arthur Williams & Jesse Hoggard (AAPO 006, $25) and also Leroy Jody Pierson (AAPO 005, $25) are on HQ-180 (gram) pressings recorded at Blue Heaven Studios. Harmonica master Arthur Williams is joined by acoustic guitar musician Jesse Hoggard who together interpret six classic 12-bar blues. The second release features guitarist Leroy Jody Pierson and his immense talents have been compared to such greats as Walter Davis, Robert Nighthawk, and Sonny Boy Williamson. Audio company claims to receive unexpected market praise from the hearing impaired. ZVOX Audio's 315 single-box home-theater loudspeaker ($200) features three upper frequency drivers, a subwoofer, built-in amplifiers, and the company's PhaseCue signal processing. PhaseCue processing produces a very wide soundfield by incorporating phase information from recordings or broadcasts. This is basically the same technique inherent in analog Dolby Surround decoding, though adapted for front-only loudspeaker placement. "In reality, enhanced listening quality for hearing-challenged listeners was not a specific design goal," says Tom Hannaher, the audio-industry veteran who with speaker-design legend Winslow Burhoe co-founded ZVOX. "However, we're not surprised to learn, empirically, that this is a common response from many of our customers. Our PhaseCue processing, and extremely efficient speakers and amplifiers improve clarity and definition for all listeners." The ZVOX 315 loudspeaker system is 17 inches wide and 14 deep and is available in either matte black or silver finish. The Recording Industry Association of America (RIAA), a trade group that represents manufacturers and distributors of approximately 90 percent of all legitimate sound recordings produced and sold in the United States, has filed copyright infringement lawsuits against 405 students at 18 different colleges across the United States. Claiming there has been "egregious abusers of Internet2," an advanced high speed network created by participating colleges and universities for important academic research with file sharing i2hub software, the RIAA says over 1.5 million files have been shared including over 930,000 songs. The RIAA press releases also states "In addition to the 18 campuses whose students are being sued, the RIAA has evidence of i2hub infringement at another 140 schools in 41 states. While these schools were not included in the initial round of lawsuits, letters are being sent to each university president alerting them to the illegal activity occurring on their campuses." The schools included in this recent lawsuit are Boston University, Carnegie Mellon University, Columbia University, Drexel University, Georgia Institute of Technology, Harvard University, Massachusetts Institute of Technology, Michigan State University, New York University, Ohio State University, Princeton University, Rensselaer Polytechnic Institute, Rochester Institute of Technology, University of California - Berkeley, University of California - San Diego, University of Massachusetts - Amherst, University of Pittsburgh and University of Southern California. Sony's Elevated Standard (ES) line now includes two new DVD/SACD players, the DVP-NS9100ES ($1,300 and DVP-NS3100ES ($500). The DVP-NS9100ES includes dual i.LINK IEEE-1394 and single HDMI outputs and 720p/1080i up scaling with 14-bit/216MHz DAC. Both 5.1 and stereo SACD analog outputs are offered and the unit also handles DVD-R/-RW/+R/+RW, MP3, JPEG, CD-R/-RW, VCD and SVCD. Sony's DVP-NS3100ES DVD/SACD player has HDMI 720p/1080i up scaling, 12-bit/216MHz DAC, and handles DVD-R/-RW/+R/+RW, MP3, JPEG, CD-R/-RW, VCD and SVCD. Audience has announced their new Adept Response High Resolution Master Power Conditioner ($3,800). In addition to power protection, RF filtration, and partial power factor correction, the Adept Response offers 12 outlets, each of which is individually filtered and isolated. The unit avoids using Metal Oxide Varistor (MOV) that is claimed by Audience to "break down and behave like the world's worst capacitor across your power line, storing energy and releasing it as performance robbing, time delayed distortion into your audio system." For surge protection the Adept Response employs a non-wearing type high voltage transient suppression device. Attention has been garnished to every detail of the unit including the high quality magnetic circuit breaker as a power switch. Also of note are the use of Auricap high resolution capacitors used exclusively in filter sections and the use of Hubbell high conductivity power receptacles. A ground loop isolation transformer reduces the possibility of hum. The 14 lbs. unit measures 19 x 5.0 x 9.0 (WxHxD in inches) and is available in natural brushed aluminum finish. From the talents of Chris Sommovigo, designer of the legendary Illuminati cables, Stereovox has announced their HDX2 AES/EBU ($349.99 up to 1.0m) high definition digital interconnect. The cable features "pure" 110 Ohm performance with Xhadow Reference XLR connectors. This new cable is part of the company's well-received Studio line. Enjoy the Music.com offers three reviews of Stereovox cables including their Remarkable SEI-600, LSP-600 and HDXV, and an HDXV folow-up review. Canton has introduced the LE 100 Series consisting of six models: the LE 190 ($1199) and LE 170 ($899) full-range tower speakers; LE 150 CM ($449) center channel speaker; LE 130 ($599) and LE 120 ($449) compact two-way speakers; and LE 110 ($449) on-wall speakers. Each model incorporates Canton's silk dome tweeter with a completely redesigned geometry employing a finer silk material for lower distortion characteristics and wider bandwidth. The tweeter mounting plate was also redesigned with a slightly flared profile that provides a smoother frequency response, greater bandwidth, and a 3dB increase in tweeter efficiency across the operating range. Bass and midrange drivers across the line feature polypropylene cones and injected rubber surrounds. The 6- and 7-inch drivers used as woofers in the two-way systems, and as midranges in the LE 170 and 190, feature unique concave dustcaps. Larger loudspeakers within the LE series also employ 8-inch versions used as woofers. All of the LE 100 models are currently available in bicolor finishes including Beech cabinet with a silver lacquer front baffle, or cherry cabinet with a graphite front panel or in single-color black ash, or silver lacquer finishes. 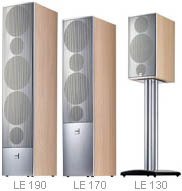 The LE 190 floorstanding speaker is the largest model in the series. It features a three-way bass reflex design, employing a pair of 8-inch woofers, a single 7-inch midrange, and 1-inch fabric dome tweeter. The LE 170 floorstander employs a sophisticated 2.5 way design that uses a pair of 7-inch cones for deep bass reproduction, but routes midrange frequencies to only the top cone to provide improved off-axis dispersion. The two-way LE 130 employs a 7-inch woofer and 1-inch tweeter in a front-ported cabinet suitable for mounting on a shelf, or on the optional LS 600 stand. Music is the key event as Naxos faces legal charges, the Recording Industry Association of Japan (RIAJ) wins appeal against file sharing, and the United States Librarian of Congress' annual selection of recordings for the National Recording Registry. Naxos, known for remastering decades old classic music titles of historic significance, has lost a lawsuit in New York's highest court. This all stems from Naxos selling 1930s classical music recording produced by The Gramaphone Co. Limited that are now owned by Capitol Records. Capitol Records sued Naxos and the New York court has ruled that common law protects music copyright made prior to such laws enacted in 1972. British law states a limitation of 50 years, yet this new ruling could have drastic impact on reissuing long out of print yet historically important and 'lost' recordings. Asia's Recording Industry Association of Japan (RIAJ), the JASRAC, and nineteen record companies have won an appeal against file-sharing service Japan MMO. The case began in 2002 concerning Japan's MMO file sharing services that contained copyrighted material. In December 2003 Tokyo's District Court ordered Japan MMO to pay out �36.89, which was appealed and is now being upheld by the country's District Court. The United States Librarian of Congress has chosen their annual 50 sound recordings to be entered within the National Recording Registry. Main considerations are that sound recordings are "culturally, historically, or aesthetically significant." Nominations for the registry come from members of the public via online suggestions and the National Recording Preservation Board. The below complete 2004 listing is listed in chronological order and nominations for the 2005 National Recording Registry is now opened until July 1, 2005. 13. "The Suncook Town Tragedy," Mabel Wilson Tatro of Springfield, Vt. (July 1930). 16. Rosina Cohen oral narrative from the Lorenzo D. Turner Collection (Summer (1932). Ancient Audio has released their new Silver Grand amplifier (�25,000) and the upgraded Lektor Grand CD player. The four piece Silver Grand single-ended amplifiers use 300B and E88CC tubes with an external solid-state power supply for each monoblock. An oversized power transformer bank of 2400uF / 450V HT capacitors, fully regulated stages and stabilized filament are just some of the features. Ancient Audio's Lektor Grand CD player (seen here) features a three-piece concept with separate CD transport, left and right DAC chassis. Philips' CD-Pro2 transport and supporting Tent Labs low jitter (3ps) precision clock insure accurate reading of the digital data. The data is then transmitted via I2S to the Lektor's second generation Silver DACs. The vacuum tube output stage features a 6H30 Sovtek tube and feeds a 100dB-range volume control. The grey bases are made from solid slabs of granite with a system total weight of 80 lbs. Enjoy the Music.com has begun posting our Le Festival Son et Image de Montr�al 2005 show report! Over the next few days we will be adding to our report with many exclusive photos and new product information. This coverage marks our seventh consecutive year reporting on the Montreal show and we invite you to see our 2005 Montreal report by clicking here. Enjoy the Music.com now offers our April Review Magazine featuring equipment reviews including Subatomic String tuning devices, ACI's Titan subwoofer, the Benchmark DAC1, Boston Audio Design's TuneBlocks, and Cain & Cain IM-Ben loudspeakers. We also have extensive coverage of Singapore's NoiSING 2005 DIY Audio Gathering! Five new editorials consist of Scams, Sock Puppets And Gorilla Marketing, Bill Gaw's AA Chapter 66, Steven Stone further explores nearfield monitoring, Jeff Rabin provides his thoughts to the intrinsic superiority of VHS to DVD, and lastly Chris Boylan gives his insight into the recent press conference with EMI and DTS. Of course the Enjoy the Music.com� Review Magazine also has many new music reviews too! See the April issue of our Review Magazine by clicking here.